#AmazonPrints is REALLY Worth the Try! $1000 of Amazon Gift Cards to be Won! Do you love taking and printing photos as much as I do? Then, you are going to want to try Amazon Prints! Amazon has launched this photo printing service that allows all customers to print their memories. 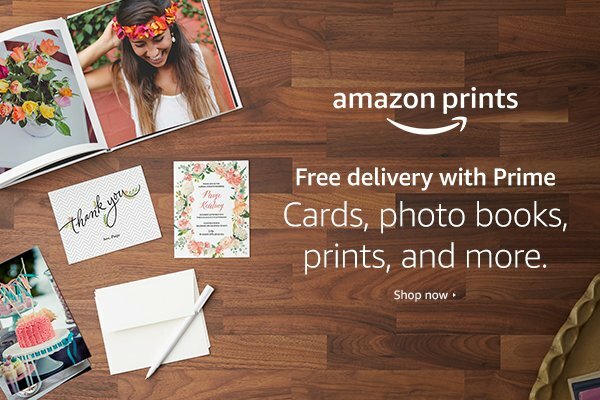 With Amazon Prints, Prime members can upload images to their Prime Photos account, print the product of their choice, and receive free delivery. If you’re not a Prime member, you’ll receive 5 GB of storage free on Prime Photos and be able to print your favorite photos. Prints start as low as $0.09. I love the free delivery with Prime and that I never have to leave the house to get my pictures printed! Plus, since I am a Prime member, I get free unlimited photo storage with low pricing! Then once I have my pictures uploaded, I can print them or make them into photo books, photo gifts, or even photo canvases for my house! You can even make your photos into cards or calendars, which make great gifts!